This incident happened after a man named Jacques Bleck came in the area accompanied by police and agents of the Intervention brigade against land insecurity (BRICIF) in order to execute a judgment. The man, Mr. Jaques Bleck claimed hat his family holds 317 "carreaux de terre" (Haitian acres of land) in the area. Deputé Vickerson Garnier told Haitian newspaper Le Nouvelliste the situation escalated when a 12-year-old boy was shot by police. 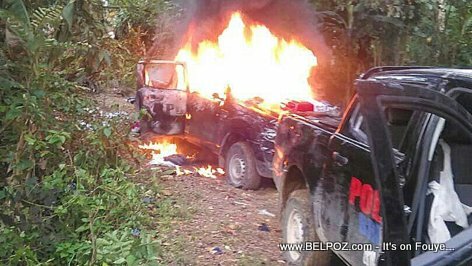 In anger, members of the public torched the two vehicles carrying police officers. Haiti Police, fleeing in catastrophe the fury of the population, ran away leaving their weapons behind.